The festival begins with the Ceremonial Delivery of the Last Canes and the crowning of the King and Queen of the Festival – the most productive male and female cane cutters of the season. Bridgetown Market consists of several stalls which sell local food and beverages as well as local arts and crafts. Enjoy the calypso music and the live tuk bands as you browse through the stalls. Folk concerts and art and photographic exhibitions are integral parts of the festival, highlighting Barbadian history and culture as well as the artistic talents of Bajans. Calypso is one of the main features of the Crop Over festival. The calypsonians are organised into “tents” and Calypsonians compete for several prizes and titles. The Party Monarch competition is held at the picturesque East Coast Road, where the calypsonians perform on a stage with the Atlantic surf as the backdrop while the spectators gather in the hillsides with their picnic baskets. The finals of the Pic-O-De-Crop competition is held at the National Stadium, and this is followed by the Fore-Day Morning Jump-Up! The grande finale is the Grand Kadooment! 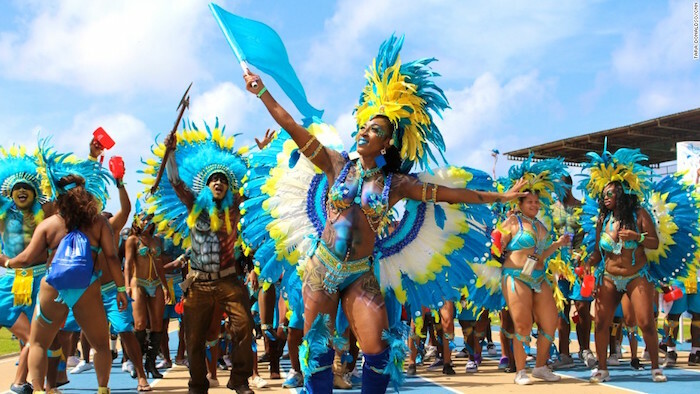 Scheduled on the First Monday of August each year, this carnival parade features large bands with members dressed in elaborate costumes to depict various themes. Designers compete for the coveted Designer of the Year prize while the revelers seem more intent on having a good time. The revelers make their way from the National Stadium to Spring Garden accompanied by the pulsating rhythm of calypso music. When they reach Spring Garden, the party continues with more fantastic music, lots of food and drink and, for some, a quick swim at the nearby beach. A grand end to a grand festival.